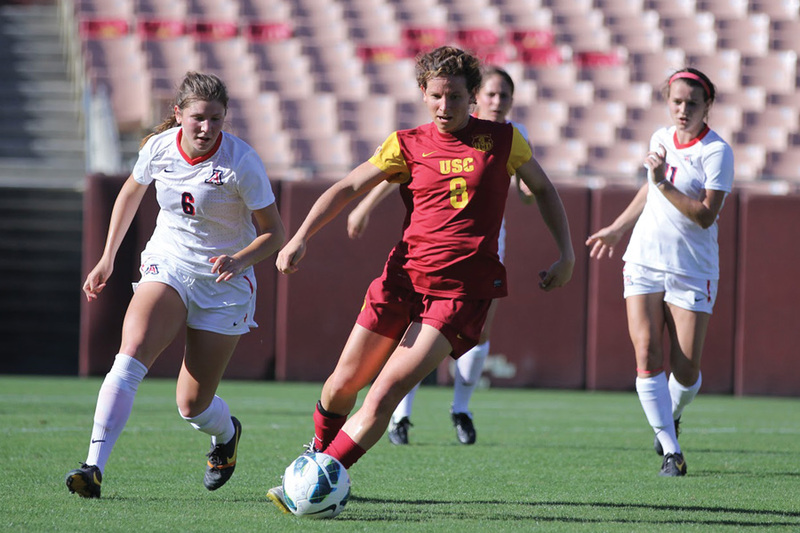 The USC women’s soccer team entered the 2013 season with hopes of building off the momentum from the previous season, which they ended by upsetting archrival UCLA at home. After earning a No. 25 preseason ranking this year, the Women of Troy hoped to improve on a 6-10-3 (3-6-2 Pac-12) record and make an appearance in the NCAA Tournament. But even though the team occasionally showed a lot of promise, missed opportunities caused the Women of Troy to fall to an 8-10-2 (3-7-1 Pac-12) finish, and head coach Ali Khosroshahin was fired after the Women of Troy lost 4-1 to No. 2 UCLA to end the season. USC hasn’t had a winning season, made the NCAA Tournament or finished higher than sixth in the Pac-12 since 2010. USC started off the season strong, scoring four goals in each of their first three games while only allowing four goals total. The 12 goals were a program record for USC in its first three games, while the 3-0 start matched the Women of Troy’s best since 2007, the year they won the NCAA Tournament. USC stumbled a bit through the rest of its nonconference schedule, finishing 2-3-1 to head into Pac-12 play with a 5-3-1 record. The sequence still had its highlights, including a 5-1 victory over Loyola Marymount, the most goals the team had scored in a single match since 2010. Sophomore forward Katie Johnson earned a hat trick in the win, marking the first USC hat trick since senior forward Elizabeth Eddy pulled it off in that same 2010 match. The Women of Troy had a rough start to conference play, losing their first three contests and failing to score a goal in any of them. The team bounced back up in Northern California, earning a 1-1 tie against California and upsetting then-No. 5 Stanford 1-0. The Women of Troy hoped to carry that momentum into their game against Arizona in the Coliseum, but the Wildcats pulled out a 3-2 victory in overtime. USC would go 2-2 in its final games leading up to its match against the Bruins in Westwood, including a 2-1 win over Oregon State in the last minute of overtime on Senior Day. Sophomore midfielder Jamie Fink scored the first goal the Bruins had allowed at home all year, and the Women of Troy went into halftime with a 1-1 tie. 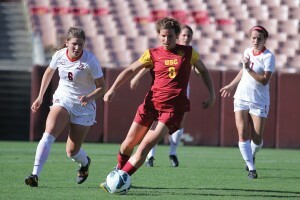 But UCLA took over in the second half, scoring three goals en route to a 4-1 win to remain undefeated in the conference. 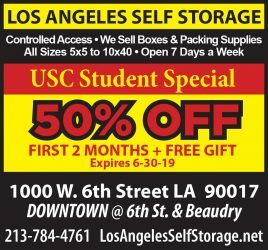 And with that, Haden decided he had seen enough — Khosroshahin was let go the following day, marking the end of an era in USC soccer. Khosroshahin, who led the Women of Troy to their first national title in 2007, leaves USC with a record of 82-53-15 (30-31-8 Pac-12) in seven seasons, but just a 21-33-5 (10-20-3) mark in his last three years in Los Angeles. Eddy led the team with six goals on the season, while Johnson and Fink finished with five each. Freshmen played a big role for the Women of Troy, as defender Mandy Freeman earned All-Pac-12 First Team Honors, while midfielder Kayla Mills led the team in assists (8) and points (16). Both Freeman and Mills made the Pac-12 All-Freshman Team, while Freeman became the first USC player to be named a conference first-teamer since 2009 and the first freshman since Amy Rodriguez in 2005. Fink also earned a spot on the All-Pac-12 Honorable Mention. “They’re definitely gonna help us out and be as strong, if not stronger, next year,” Musmanno said about the impressive crop of freshmen. 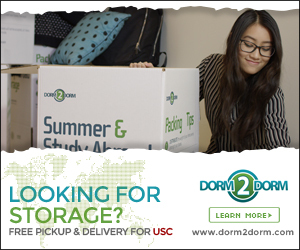 Despite creating plentiful scoring opportunities, USC often failed to convert on its chances. The Women of Troy dominated their opponents in shots (350-199) and corner kicks (129-64) on the year, but were only able to outscore them 31-27. 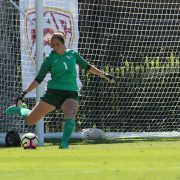 The USC defense and goalkeeping from junior goalkeeper Caroline Stanley helped keep the Women of Troy in their matches, as eight of their ten losses were by only a goal. But ultimately, the squad couldn’t pull out enough wins to earn an NCAA berth, and Khosroshahin paid the price.